National Hockey League Commissioner Gary Bettman presents Comcast Spectacor Chairman Ed Snider with the Lifetime Achievement Award during Global Sports Summit in Aspen, Colo., on Monday, Aug. 3. The award is presented annually to a distinguished team owner who has made a lasting contribution to their team, league, and community through their leadership and commitment over an extended period of ownership. Snider’s emergence as a leader in the Philadelphia sports market began in 1966 when he brought a National Hockey League franchise to the city as the founder of the Philadelphia Flyers. He became the driving force behind the construction of the Spectrum and assumed control of the building in 1971. In 1974, Snider created Spectacor as the management company to oversee the Flyers and Spectrum. Over the next 20 years, Spectacor experienced unprecedented growth, earning national acclaim for its impact in the sports and entertainment business. Under Snider’s guidance, Spectacor developed and acquired nearly a dozen related companies. In 1996, Snider merged Spectacor with the Comcast Corporation to form Comcast Spectacor. The new venture initially consisted of the Philadelphia Flyers, Philadelphia 76ers, Wells Fargo Center, the Spectrum, and the Philadelphia Phantoms. Comcast Spectacor then joined with the Philadelphia Phillies to form Comcast SportsNet, one of the highest-rated regional sports cable networks in the country. 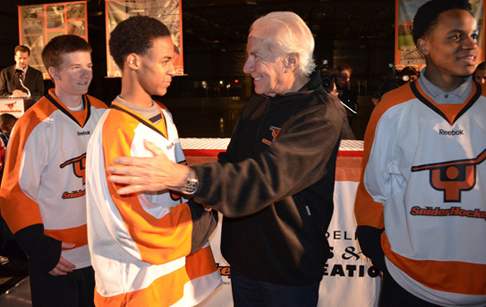 One of Snider’s proudest accomplishments is the creation of the Ed Snider Youth Hockey Foundation, which provides underserved children from urban neighborhoods in Philadelphia and Camden with the opportunity to learn to play ice hockey. The program features comprehensive educational services that are specifically designed to keep boys and girls on track for on-time graduation. Hockey is simply the hook that is used to gain and hold the attention of these youngsters so that greater life lessons can be imparted. All services, including equipment and travel are delivered at no cost to city residents. The Foundation partnered with the City of Philadelphia and the Commonwealth of Pennsylvania in 2010 to complete a $14.5 million construction project, completely refurbishing the four public rinks for year round use. This project included new classrooms, learning labs, and public meeting space, as well as upgrading these rinks to NHL standards. Snider Hockey now funds and administers programming for over 3,000 youngsters at nine inner-city sites. Snider’s success and business acumen have been widely recognized by his peers. He was elected to the Hockey Hall of Fame in 1988 and serves on the NHL’s Executive Committee. He is a recipient of the Lester Patrick Award for outstanding service to hockey in the United States and has been elected to the U.S. Hockey Hall of Fame, the Pennsylvania Sports Hall of Fame, the Philadelphia Sports Hall of Fame, the Philadelphia and Washington Jewish Sports Hall of Fames, and the Flyers Hall of Fame. In 2005, he received the Greater Philadelphia Chamber of Commerce’s William Penn Award, the most prestigious business honor in the region, and the Ellis Island Medal of Honor awarded to Americans of all ethnic backgrounds who have made significant contributions to our society. The Philadelphia Business Journal named Ed Snider Philanthropist of the Year in April 2015, in recognition of the work of the Ed Snider Youth Hockey Foundation. Snider and the Snider Foundation donated $5 million in 2014 to his alma mater, the University of Maryland, to create the Ed Snider Center for Enterprise and Market. Snider received honorary degrees from Hahnemann University and Thomas Jefferson Hospital. He is also a Benefactor of the Sol C. Snider Entrepreneurial Center of the Wharton School of the University of Pennsylvania and Vice Chairman of the Simon Wiesenthal Center. Snider’s philanthropic generosity has benefitted numerous organizations and agencies throughout the Greater Philadelphia Region. In May 1999, readers of the Philadelphia Daily News selected him as Philly’s greatest mover and shaker of the millennium. Snider and his wife, Lin, reside in suburban Philadelphia. His children are daughters Lindy, Tina, and Sarena and sons Craig, Jay, and Samuel, as well as 15 grandchildren.